This is a guest article by author Edoardo Binda Zane. We start with 5 steps for how to put a proposal budget together and then Edoardo shares a worked (fictional) example to show you what the budget would look like once it is completed. A proposal budget is similar to a project budget, but with a very different goal. A project budget is meant to guide you step-by-step throughout the project phases, and is meant to be changed and adapted (within limits, of course) to what happens during the project itself. A proposal budget instead aims to convince the evaluator that reads your proposal that you have a solid grasp of your plan and that you are worthy of being trusted with funding. Granted, if the budget you build in the proposal phase is carefully put together and everything goes according to plan, you will end up using that directly as your project budget, but for the purposes of this article, let’s just stick to the proposal phase. So, how do you convince an evaluator that your idea will work? First, you need to explain your project and process well in the narrative of your proposal. Second, you need to provide solid justification for the costs you will incur in each phase. Not only a solid justification, actually, but also a synthetic one. In a nutshell: the evaluator needs to be able to read a one-to-two-page document and feel reassured enough to give you the £600k you need. In this article, I will show you exactly how to do that. Gantt charts are loved and hated. It is undeniable, however, that they are the clearest overview you can get of a project in its entirety. If you’re trying to convince the evaluator, then plot every work package and task on a Gantt chart and provide him or her with a clear picture of what will happen when. This will also tell them that you have thought that part out carefully. This is a core point. In order to estimate costs well, you first need to estimate the amount of work you need to put into each activity you have planned. Not only that: you need to estimate who will do the work. I don’t mean who personally (name and surname), I mean what type of person or role will work on each task. Is it developers? Is it marketers? Is it researchers? Each one has a different hourly rate and a different pace of work. Plan your person-days accordingly. 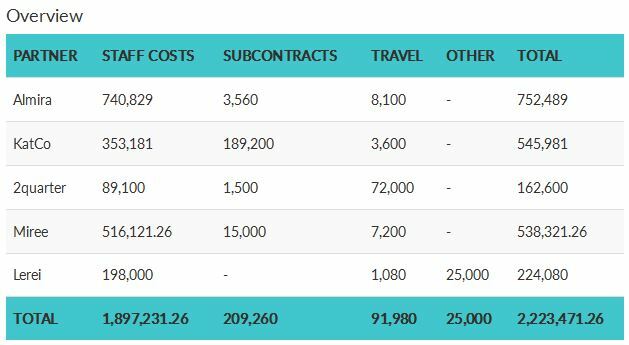 If you are part of a consortium, remember to separate these estimates per company, as you will also need to present the budget broken down per company. In the example below, Almira has been allocated 656 person-days for work package 1. Once you have the duration and the person-days or hours for each project task, it’s time to write down how much their work would cost. 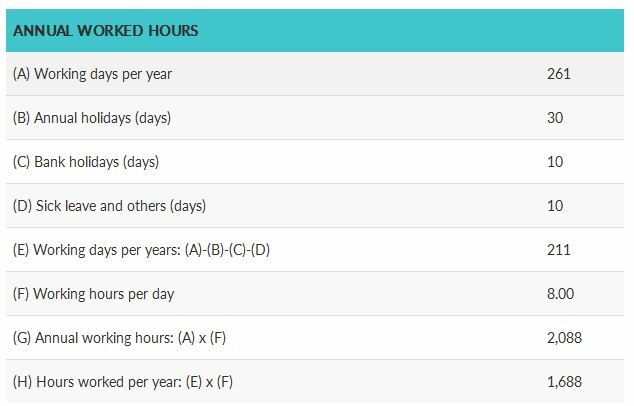 To do this, you simply need to multiply the hourly or daily rate of each category of personnel in each company by the amount of days/hours they will be working. If you want, you can also work with a weighted average, your call. As for the daily rate, if you are not familiar on how to calculate it, take a look at the end of the article as I’ve included a brief how-to for you. In the example below, Almira’s 656 person-days have been broken down into four staff categories with four daily rates. Multiplying daily rates by person days per category and summing the four totals gives the budget allocation for Almira for WP1 (540,25*122 + 489*255 + 262*255 + 125*24 = 260.415,50). Subcontracting and travel costs are the two other categories of costs you need to take care of. You can add a third category “other” to use for whatever costs are still left out (e.g. purchasing specific equipment). For Travel Costs, multiply the number of travellers by the cost of a return ticket to their destination. Slightly overestimating the costs is a good idea. After you have that, add a daily allowance for each traveller. If you don’t have estimates for daily allowances you can refer to the official ones used for the OECD staff (available here). Remember to note what work package each travel is grouped under. For subcontracting you merely need to indicate who you will hire, in what work package and for what. As mentioned in the beginning, presenting everything in a clear and simple way is the number one requirement of a good budget. So how does this budget information look in your proposal? Below is an example of how it all comes together. This is taken from my book: “Writing Proposals: a handbook of what makes your project right for funding”. All company names are made up. All partners except Lerei will be sending 2 people to each meeting. 9 meetings have been planned, totalling 18 travellers per partner (9 for Lerei). 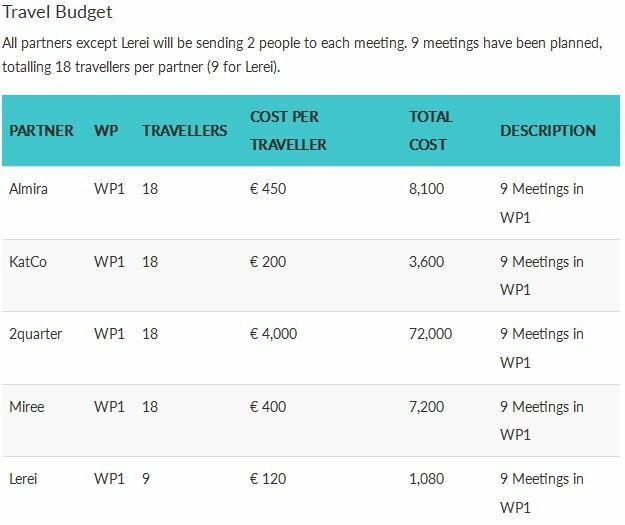 The listed cost of €25,000 is for the purchase of a specific accounting software package for WP1. The picture below outlines the timing of the project throughout the 41 planned weeks as well as the deliverables throughout the project. Sum the above costs and divide the total by the hours worked per year to obtain the hourly rate. About the author: Edoardo Binda Zane is an innovation trainer and creativity consultant. He’s the author of Effective Decision Making and Writing Proposals: A Handbook of What Makes Your Project Right for Funding. Download this article as a PDF to learn how to create a proposal budget in 5 easy steps along with all of the examples. Please send me the PDF via email. My brother has a business and he wants to have it developed. It was discussed here that he should estimate the labor cost and write it down. Furthermore, it’s advisable to consult experts when considering federal proposal development.